o 2 versions (tractor and chassis-cab) with gross vehicle weight of 18 to 32 tonnes and gross combined weight of up to 44 tonnes. o 3 engines offering 8 power ratings of up to 560 HP. o 3 cabs: HI-STREET - day cab and standard roof for single-day work, HI-ROAD - sleeper cab with standard or high roof, for medium-range work, HI-WAY - maximum width sleeper cab with standard or high roof for long-haul work. 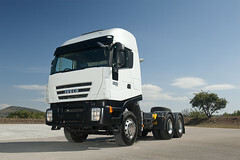 o 2 or 3 axles with different configurations and a choice of fixed, liftable or steering axles, depending on application.